Comprehensive Kit Teaches Cloud Types. 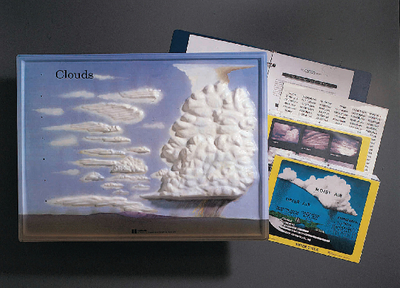 Used indoors on its own, or outdoors while observing cloud formations, this 3–D model helps students learn to identify the different types of clouds. To test their understanding, take the removable labels off the model and let students identify the cloud structures and altitudes. An activity guide, glossary, key, worksheet copymaster, and full–color overhead transparency are all contained in a three ring binder.